Actually, Kat, aside from the Mid-Size Bond (2251.80) that I got as a graduation present from my dad, and which I eventually replaced, almost ten years later (with his blessing) with a 2531.80, I've only ever bought the "standard" sized Omegas, which they label, "Gents Size." 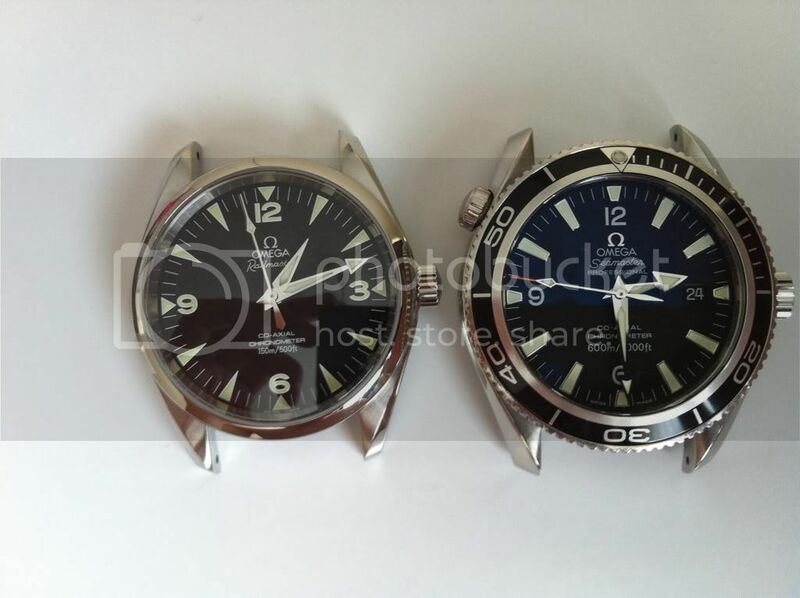 Other than the first Omega that was a Mid-Size, I've never owned an Omega that was either larger than or smaller than standard. Their sizing works perfectly for me, as I think I have a very average wrist size and shape (7" around and flat on top and bottom). This new AT is not different. It fits me perfectly. I'm really falling for this watch. 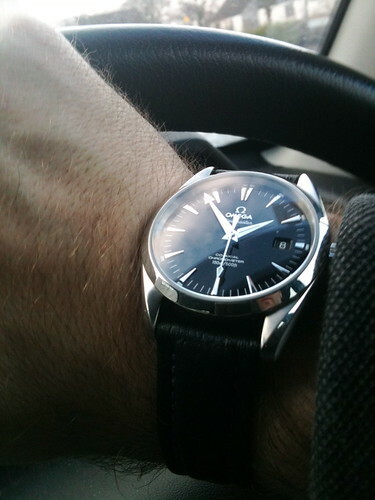 I already know it's my favorite Omega that I've owned, and by a long way. I like the way it looks in your photos, with the chocolate brown strap, but I realized my dark brown strap was basically the same color, and when I mocked it up with the gray dial, I didn't immediately love the combo. I then tried the black strap, and to tell you the truth, it didn't look great on black either. Hmmm. Thanks, enkrypt. I'll try and set it up for some better shots in the near future. I'm glad this quick one spoke to you, though. This watch is so much better in person... that's all I can say. In person, it looks like a stepped dial, which makes the teak detailing seem to make more sense as its own element. Overall, the finishing is just simply a step above the 2500 PO and (dare I say it? ), the Speedy Pro. 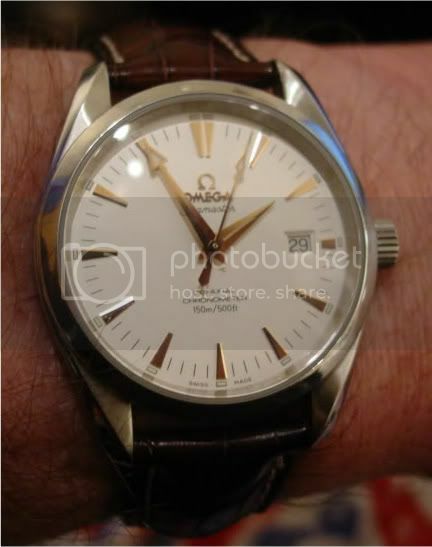 I'm not saying there's anything wrong — at all — with those fine, fine, excellently crafted watches, but rather that with the 8500 AT, Omega really made it a goal for it to feel more high-end. Mission accomplished, IMHO. BTW, other 8500 AT owners, does your outer AR coating reflect a bit blue? Much more so than recently produced POs? I can't tell if mine does, or if it's just that the outer AR on these ATs are less "clear," less anti-reflective, than the PO's? Anyway, thanks, guys for the new photos added to this thread. Please keep them coming! Last edited by Dixan; July 16th, 2011 at 21:14. I would agree with your initial perceptions. I tried the AT 8500 in an AD a couple of months ago. It just seems a more high level piece than the AT 2500. This is not a criticism of the AT 2500 which is a fantastic watch. 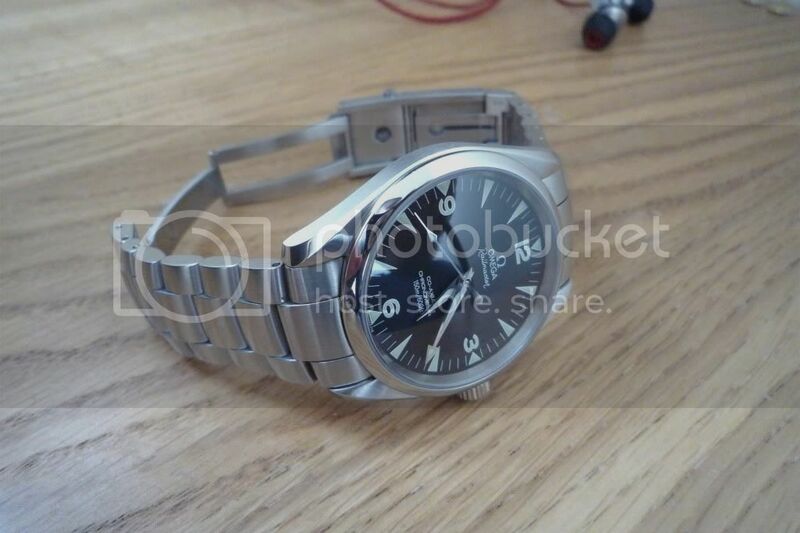 I just think that Omega have moved up a level with the AT 8500. Looking forward to a through review. Hey, Kevin. I guess I assumed that since you knew where to purchase small size Hirsch straps for ME, that you, too, had smaller wrists. My bad. I, also, agree with all of your perceptions. If I had to pick between this and my PO, the PO would be missed, a little, but be sent on its way, nonetheless. This is, by far, my favorite watch........EVER! I love it more each day. It looks great on the bracelet and just as good on the strap. This OEM chocolate brown is a very dark rich brown, and the semi-matte finish makes it look really good. 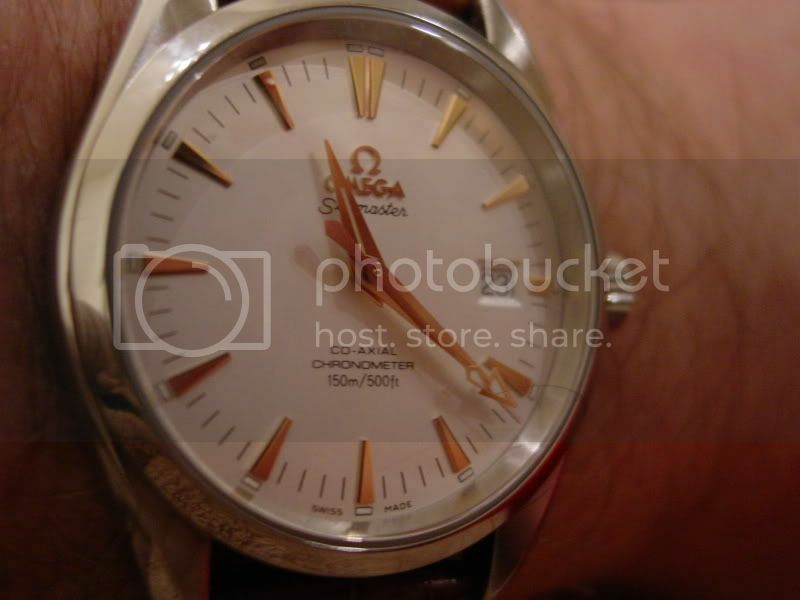 It is the same model strap that Omega puts on its rose gold ATS. It actually looks and feels like it SHOULD cost almost $400.00. You mentioned the stepped dial effect on this watch. That is a deliberate design strategy, as the dial is actually set just a bit higher than the chapter ring. 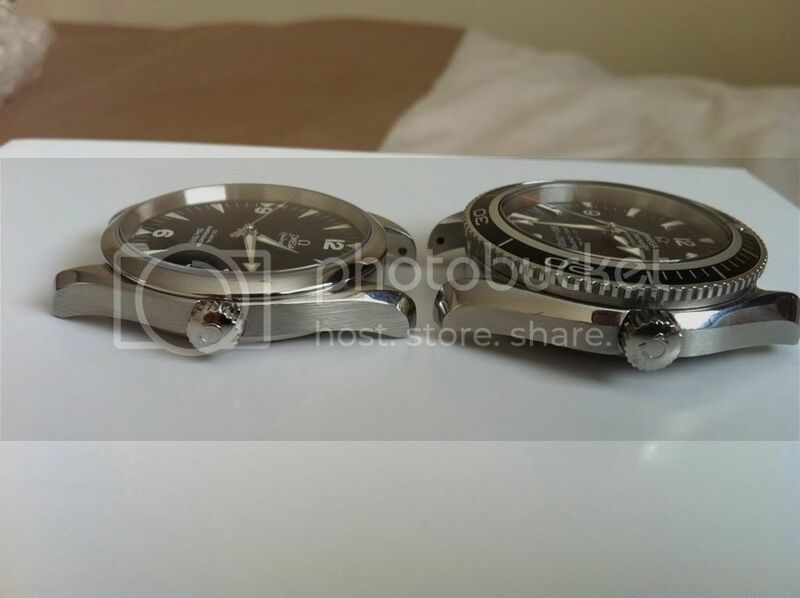 That, along with the "teak concept" dial design, give it a pronounced 3D effect. With its captivating dial design, white gold hands and indices, it reflects a lot of light, and actually changes color, like a chameleon. It varies from looking light gey, to dark grey, to near black, and in bright sunlight, looks brown. I agree that the 2500 AT is a beautiful watch, but THIS is simply stunning. Pics don't come close to doing it justice. I am so glad you're enjoying your 8500, as much as I. Congrats, and wear it in good health. As for the color of the outer AR coat, it gives off a very pale blue tint in some lighting situations, but is much lighter than the 1st generation blue of my PO. I'm assuming it's the same, as that used in the more recenly manufactured POs. Last edited by KatGirl; July 17th, 2011 at 03:14. I do miss my original AT. It's the more classic looking design, for sure. 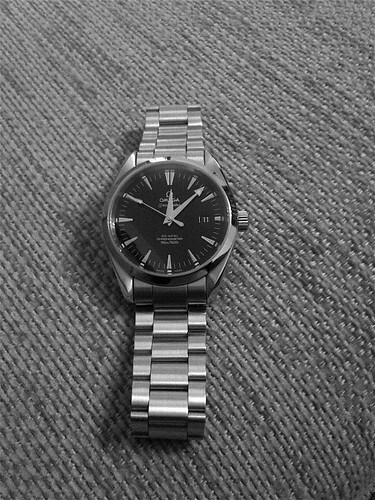 It has a quiet confidence that the new watch simply does not even try to emulate; they've taken a different course now. While I do love the new watch very much, and it does feel fancier in many ways, it can't ever replace the old AT in my heart. As happy as I am with the new direction I am taking with my little collection, I do know already that my lineup will forever have an 2500 AT sized hole in it. Hey, Kevin. I guess I assumed that since you knew where to purchase small size Hirsch straps for ME, that you, too, had smaller wrists. My bad. I, also, agree with all of your perceptions. If I had to pick between this and my PO, the PO would be missed, a little, but be sent on its way, nonetheless. This is, by far, my favorite watch........EVER! I love it more each day. It looks great on the bracelet and just as good on the strap. This OEM chocolate brown is a very dark rich brown, and the semi-matte finish makes it look really good. 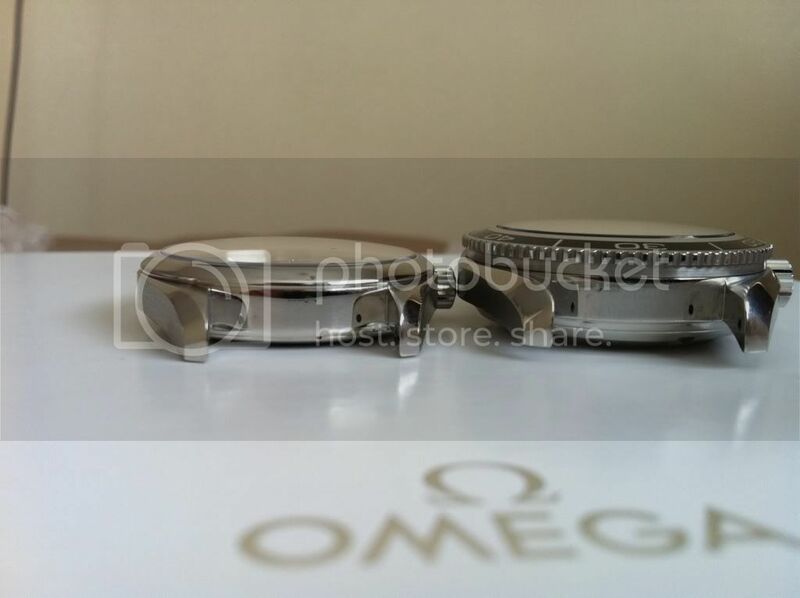 It is the same model strap that Omega puts on its rose gold ATS. It actually looks and feels like it SHOULD cost almost $400.00. You mentioned the stepped dial effect on this watch. That is a deliberate design strategy, as the dial is actually set just a bit higher than the chapter ring. 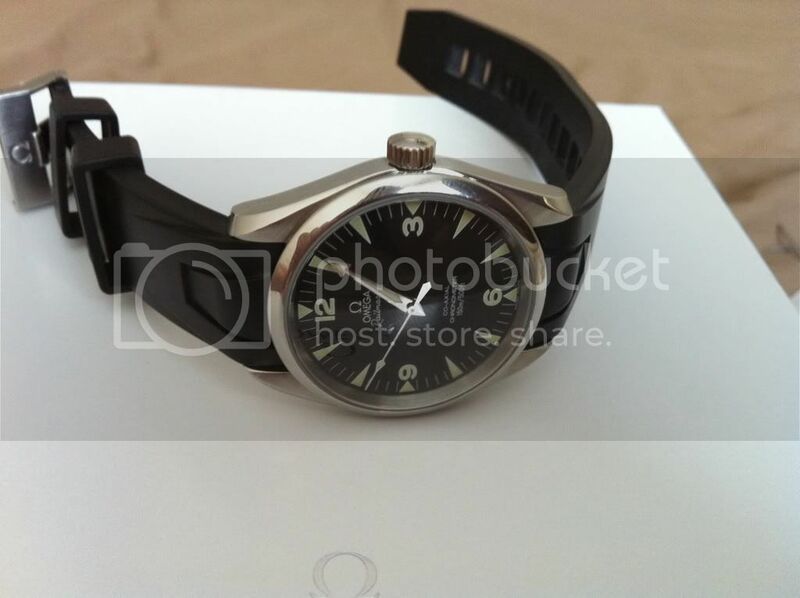 That, along with the "teak concept" dial design, give it a pronounced 3D effect. With its captivating dial design, white cold hands and indices, it reflects a lot of light, and actually changes color, like a chameleon. it goes from looking light gey, to dark grey, to near black, and in bright sunlight, looks brown. I agree that the 2500 AT is a beautiful watch, but THIS is simply stunning. Pics don't come close to doing it justice. I am so glad you're enjoying your 8500, as much as I. Congrats, and wear it in good health. As for the color of the outer AR coat, it gives off a very pale blue tint in some lighting situations, but is much lighter than the 1st generation blue of my PO. I'm assuming it's the same, as that used in the more recenly manufactured POs. No worries, Kat. That's pretty solid speculation on your part. No, the reason I knew about those straps is because I bought one a long time ago and realized it was shorter than ones I already had that came from the States. I don't actually own any shorter length straps now, though I can wear them very comfortably, being that my wrist is neither large or small. I think your strap is different to the one I have, after all. It certainly looks like a better match to the AT's gray than my brown strap. Maybe I just need to get used to the idea of the dial not being a natural match to most basic strap colors. I knew going in that this gray would be less versatile, in this regard, than the white dialed new AT, like Chiba's. It's strange how this new watch's detailing used to not appeal to me, but somehow I've succumbed to its charms, and I'm suddenly head-over-heels about it. My new Speedy will hopefully be a nice counter-balance to this watch's more decadent character. MHe225, john wilson, yande and 4 others like this. What a great thread! Some fantastic shots of the AT and railmaster here - the Cal 2500 AT that I purchased in December quickly became a favorite - eclipsing even the Speedy and it's on my wrist everyday - I love it - it's perfect for me as an everyday watch - rugged enough for most situations and yet refined at the same time. It's size, shape and fit is just right and it's very comfortable. Some quick n dirty shots below - excuse the quality of the wrist shots but thought I'd make my contribution to the thread. Dixan - love your photos! Shows off the AT beautifully. Dixan, vlad.ica and john wilson like this. Sorry... Many of you have seen all the photos I have, so far, of my new AT, but I figured since this was intended as a photo heavy resource thread, I should add them here as well. Thanks. Please post up any new shots you might have! Thanks, everyone, for making this such an enduring and well received thread! Let's keep it going. vlad.ica, john wilson, anachy and 1 others like this. Absolutely no idea why I took these pics of the planet ocean and railmaster but I thought I'd share so people can get the idea of size etc. john wilson, 4counters and vlad.ica like this. I would like to thank everyone who participated in this collection of posts. I truly enjoyed scrolling through all the photographs. 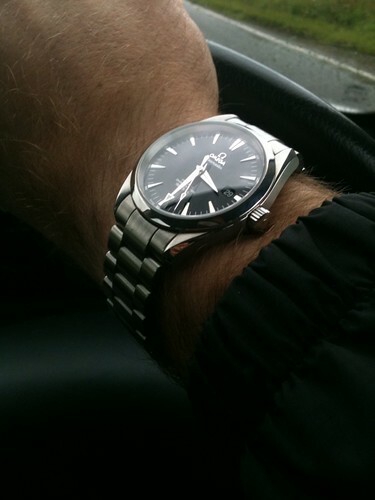 I have been wearing an Omega since I was 14 a habit picked up from my father since this was his favorite watch. 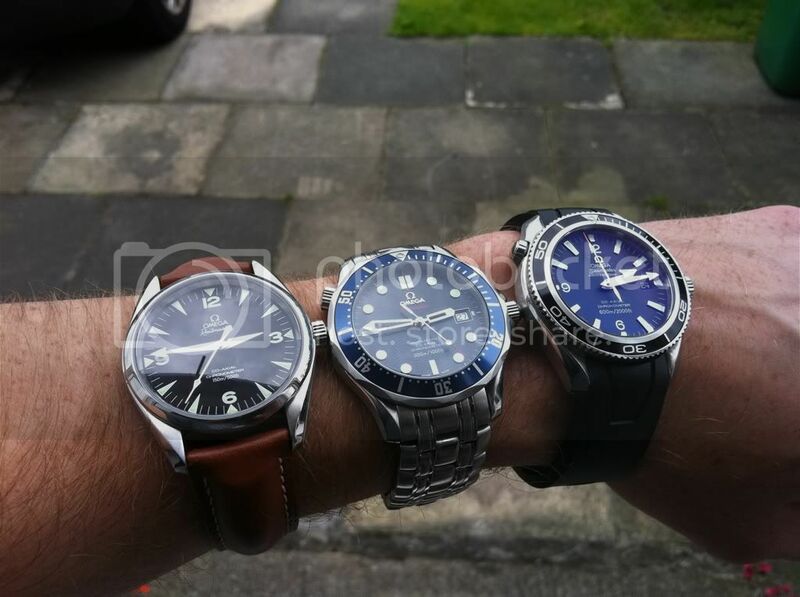 I am now 53 and have a small collection of three Omega watches. 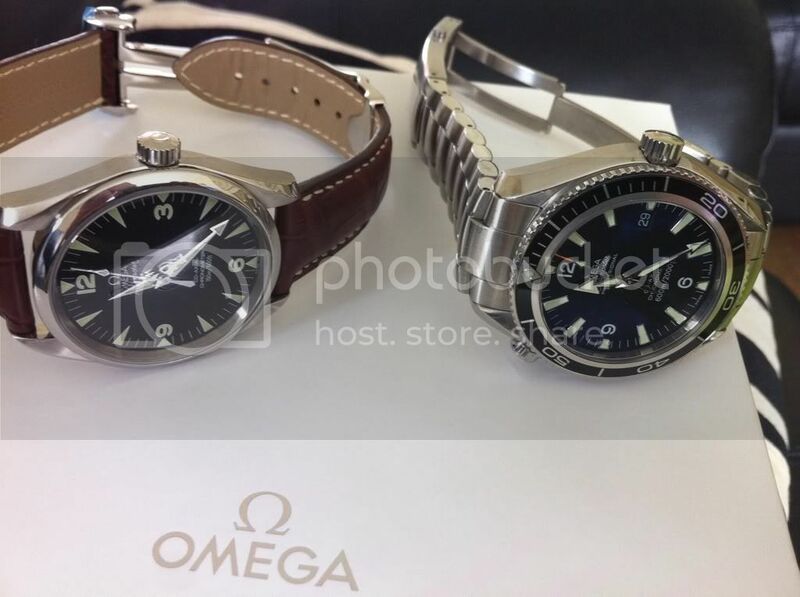 I never knew there was such a huge following until I discovered this Omega section of this forum last week. Again thanks everyone. davieg10c and girlyswot like this.